Who Am I Today – Pick a Card, Any Card. my collection (Jefferson Title). It hardly seems worth mentioning – my time there was so fleeting. The economy has not been kind to the real estate market, which is the meat and potatoes of the title insurance business. I was barely there 9 months, when I and 4 others were laid off (hate that term). 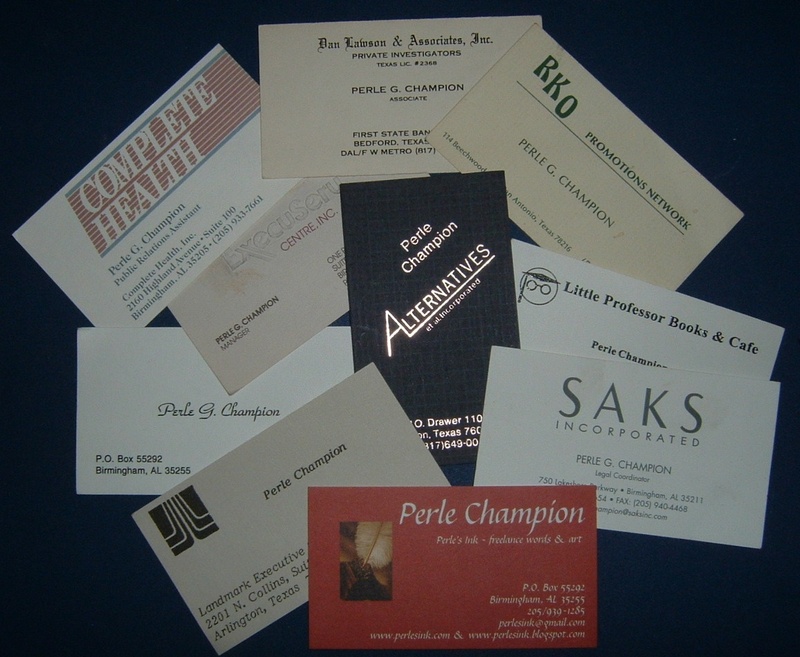 The photo was taken when I found a cache of business cards at the bottom of a desk drawer as I dug for a red editing pen. I was amazed at how many there were. After adding my last corporate card from Saks Incorporated and my newest Perle’s Ink card, they totaled ten and these are only the ones I saved. I’ve worked for myself and for others since age 17, but still ten cards in 40 plus years seems alot. Whether I moved or was downsized, I’d immediately sign up with various temporary agencies. I usually had an assignment within a day or two at most. My skill set and work ethic always resulted in permanent job offers. I am able to enter any workplace and own the job; I do whatever the job requires, as if I’d been with that company for years. It’s a gift that serves me in any job market. Being downsized in May of the year I took the photo, I took some time off to write, paint and reflect. My writing didn’t bring in as much as I spent, so I put out the word and had three offers by year’s end. I chose JT and for better or worse, 9 months later I was out of a job. Fortunately, I took Suze Ormond’s advice, I have an emergency fund. But it is dwindling fast, unemployment is running out, and I actually miss the energy of being in an office. Later – have resumes to send out, networking to do, and an e-book on spec to work on.